I’ll be adding information and progress as i tinker with my car too. Surprisingly, the car isn’t too different than the motorcycle. They share some of the same electronic components and are very simple vehicles. I’m currently in the middle of adding an alarm to the car with progressive door lock actuators. It will be great to lock and unlock the car via a remote. The keys for the car are very old, thin and flimsy so having the ability to lock the car without the key will lessen the chance of breaking the key off in the lock. The car also suffered a massive dent in the rear due to some idiot on her cell phone. My daughter and i were fine but i had to live without the car for 6 months while the repairs were made. They did an AMAZING job and i had the whole car painted . I’ve had the car back for a few months now and been fiddling and tweaking it to get it back to daily driver status. 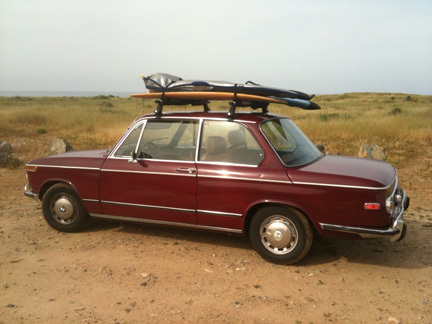 Here is a photo of the car before the accident, on her first surf trip about a year or so ago.